Copper center power brushes serve applications where light deburring, edge blending and general surface finishing are necessary. With many different diameter sizes and abrasive types available, these wheel brushes work well in a variety of applications. 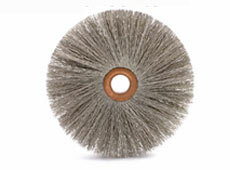 For larger surface areas, abrasive brushes work best. 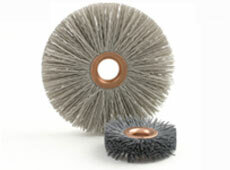 These copper center wheel brushes can be mounted and come in a range of arbor hole sizes. Find out which copper center power brushes are right for your application by contacting a distributor. Size 1 1/4"1 3/8"1 1/2"2"2 1/2"3"3 1/2"4"
Copper center is also available in nylon, tampico, abrasive nylon and encapsulation. 1" - 4" Diameters Abrasive nylon is excellent for light deburring, edge blending and general surface finishing. Copper Center wheel brushes may be gang mounted and come if a variety of arbor hole sizes. Stocked abrasive is 500AO or 600AO depending on diameter. Other grits and abrasives available. Size 1"1 1/4"1 1/2"2"2 1/2"3"3 1/2"4"